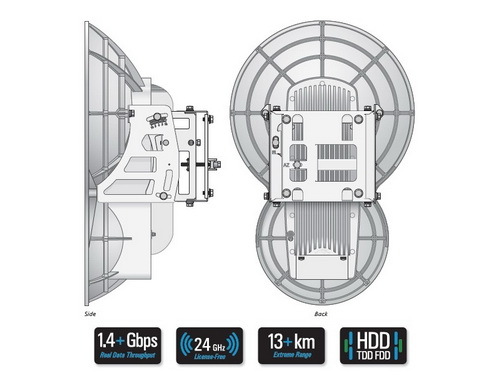 Introducing airFiber, a truly revolutionary 24 GHz Point-to-Point radio from Ubiquiti Networks. Housed in a compact, highly efficient form factor, airFiber delivers revolutionary performance of 1.4+ Gbps, aggregate throughput and 13+ km in range. airFiber ushers in a new era in price-disruptive, carrier-class backhaul technology. for unparalleled speed and spectral efficiency in the 24GHz worldwide license-free band.